Vegetarian barbecue: round two. This time, it was better than ever before. No fake meat products, no soy trying to act like something else, just straight up veggie (and cheese) goodness. We’ve been cooking outside A LOT. Like every night, since the unbelievable run of summer weather started. I had been hearing a lot about cauliflower steaks lately, and saw a gorgeous photo of one in an issue of Bon Appetit a couple months ago. Barbecue seared cauliflower steak with cast iron seared red pepper and corn, harissa tomato-corn puree, Ran-Cher acres peppercorn goat’s cheese. Yeah. It worked. The texture and flavour of the of the cauliflower, paired with the heat from the harissa puree, more texture with the corn and pepper, topped off with a bit of creamy goodness from the goat’s cheese. Highly recommended. Shout out to Liquid Gold for the harissa infused olive oil. Basically you can get a couple nice, thick-cut cauliflower steaks out of one head. You need to keep the stem intact and cut them vertically. Any leftover florets can be thrown into whatever sauce you’re making, or saved for another dish the next night. Cauliflower makes an awesome soup or puree. You’ll see how they’re cut in the photo gallery below. 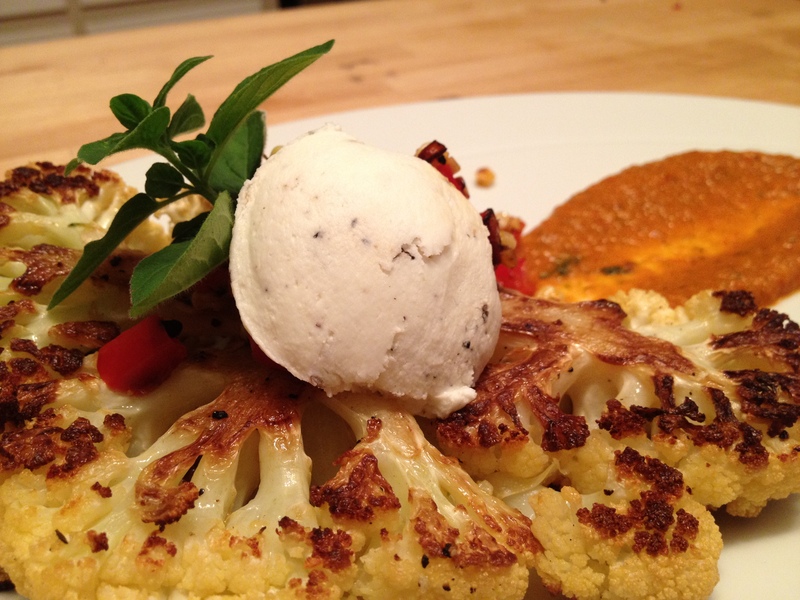 As I browsed through some different recipe ideas later, I saw an inspiration for our next cauliflower steak creation: grilled cauliflower steak topped with a poached egg and truffle oil. Done.